During this post, I will go through step-by-step how to create a free website online today, using SiteRubix. Are you ready to build your website – right here today? Having a website online is your very first step in getting your business or getting a blog online – but it doesn’t have to be complicated. In fact, you can set up a free website in a matter of seconds, which is an exciting reality. 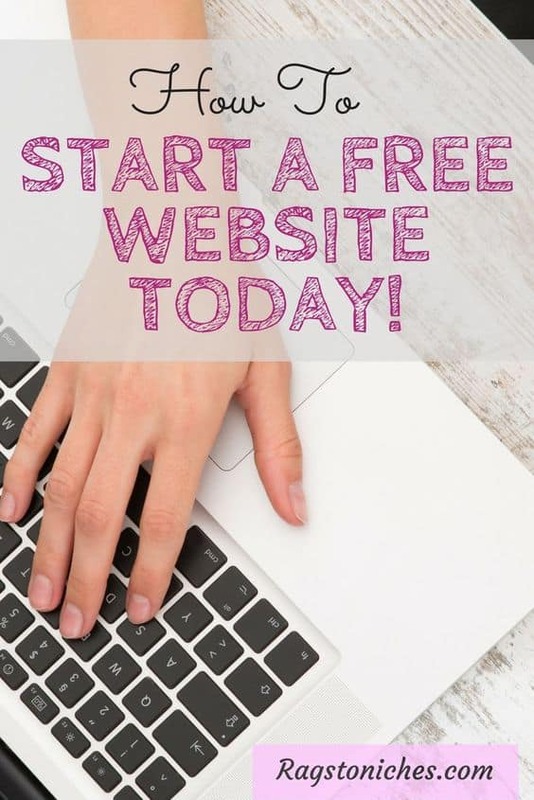 Because creating your first website is the first step you’ll take in creating your online business – and you can do this effortlessly. SiteRubix is an awesome online software, that uses WordPress to provide individuals and businesses with free, simple to create websites, without the need to download anything, nor have any prior coding knowledge. SiteRubix was launched in 2007 and has undergone many updates since then and is continually being improved year by year. A complete beginner can set up a website with SiteRubix in a matter of seconds, it is very simple to do and I will show you how in just a moment. Hosting is also included, as well as exceptional 24 hour technical support. Whenever I have had a problem and reported it, I will normally hear back within the hour and have never had to wait more than a couple before my problem was resolved. Another feature I have found particularly helpful is the SiteRubix site health monitor. 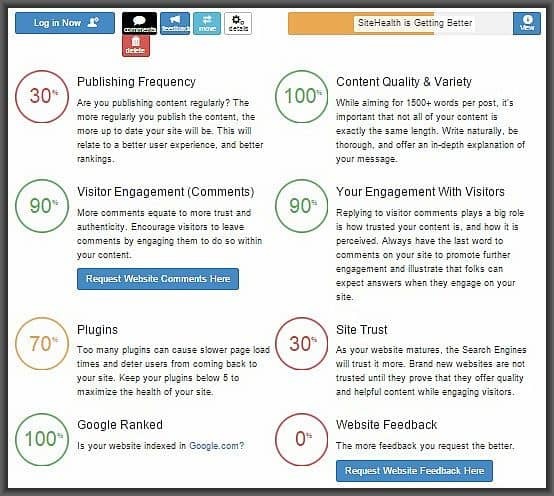 This is a screenshot from one of my sites and it shows you what aspects of your site require work. In this case, we can see my publishing frequency on this particular site is 30%, which could certainly use some improvement. Site trust is something that goes up month by month for your site, so you don’t need to worry about that unless your site has been around a long time. It took over a month before I had 10% via Site Trust. Plugins are something to be aware of, as too many can cause problems. Keep them to a minimum and remember to deactivate ones that you are not using. There are also options via the online community to gain feedback and comments for your website, which is an optional but helpful extra. Since SiteRubix is a WordPress website builder, you get a great selection of professional looking WordPress themes to choose from. WordPress is the most widely used blogging platform on the entire web today. No understanding of HTML or coding required. Over 1,400 blog/website themes to choose from. Quick and easy access to over 10,000 additional “plug-ins,” to help you create additional functionality or features. SEO friendly, (search engine optimization). Due to the framework of WordPress is easy to crawl by search engines, hopefully making it easier for you to rank in search engines such as Google. WordPress is my own personal choice and I use it on all my websites too, this website was also built using WordPress. WordPress features, plugins and features can be be accessed at the mere click of a button, it’s created to be very user friendly – which is why it’s such a popular platform. If even the thought of plugins, features, feedback and themes are somewhat alien to you, (having never built a website before) don’t panic. I knew nothing about creating a website when I created my first one either, SiteRubix makes it easy for any beginner to get started. So, Show me how to create my website! I will give you the option to start building your website right here in a moment – where you can go straight to siterubix and create your WordPress website. to do so, you will simply need to follow the steps below. Step (1) Select what type of website you’re wishing to build today. If you already own a domain, you could transfer to get hosting – however, for the purposes of this tutorial, we’re creating A FREE WEBSITE so, you click that option on the left. Step (2) Now it’s time to name your website. Simply choose a name relevant to the topic of your site, your niche or your brand. You are able to change this later, so don’t worry too much about it at this stage. Step (3) Now you choose a great look for your website, from a super selection. You can always change this later too, so just go for the one that appeals to you first the most. Step (4) You can now create your website at the click of a button. Simply click and wait while your website is built in a matter of seconds! Do you want to build a free WordPress website RIGHT NOW? …. You then need to follow the steps I outlined above and you’ll be good to go and can get started on your website in a matter of seconds. 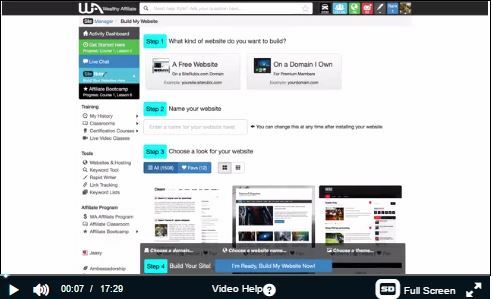 If you’d like to see someone else create a website before you take the plunge, you can watch the video below, demonstrating just how quickly you can create a website, going through the steps I showed you. clicking this pic will take you direct to the video! Hopefully you have now taken the action required to create your first brand new beautiful website. How does it look? Building a website is such an important step, so many people think about creating a website for years and just never take the action to do it. Usually because they’re worried about how they will do it, or anxious they don’t have the knowledge to pull it off. The fact that you’ve taken this action means you’ve now taken that very important step towards building a website that you are passionate about. Let me know in the comments below how you got on and – of course – if you have any questions at all, let me know. If you’d like to learn how you can make money creating a website based on your own interests, hobbies, or passions… then you should check out this free training. It’s a blogging & online business platform, where I’ve been a member for years. They have a step by step free 10 part course to get you started and there is a fantastic source of information available, as well as a very active and helpful community. Other posts you may find useful…. 40+ Ways To Make Money Online! In my past “free online site” experience, I’d tried many such as Wikia, which is very useful for Wikipedia users and the MediaWiki. In a sense, I wish SiteRubix was more customizable, very limited as to what you can do without being a CSS/HTML expert. There, I had to upload my own images for my site’s title and header. Hi, this is a great post! I like how you outlined the step-by-step guide to create a free website online. I could possible set up mine with your guide in less five minutes! Thanks for sharing this link to create one for free. No joke, I am amazed. It is absolutely free. Now if I already have a website created, what should I do next? I am planning to blog about photography and I wonder how I can monetize my site if I am going in this direction. Could you please advise? Thank you! Wow..Love the idea of a free website ..
i have so many ideas that i would like to blog about. and siterubix looks like a very supportive website building platform. Just some questions if you do not mind me asking ? 1. if i build a sitrubix free website ..does it rank in Google ? To answer your first question – people have found that siterubix ranks incredibly well, if you do the correct keyword research and SEO then you can rank on the first pages of google just like a regular “.com” can. Regarding your second question, it’s a good one! I honestly don’t know the specific numbers – but I’ve had most of my sites on 100% for a lot of the time, by simply having a couple of comments on each post and replying to those. So, it’s certainly not a mass amount! I find it goes down if you have not posted or had any comments in a matter of weeks. Hey, Nat. Most of the online money-making opportunities you shared are not available for people in my country. Why is this so?